In an early scene in Back to the Future III, Marty McFly drives the DeLorean through a mural of savage Indians beneath a drive-in movie screen. He materializes in the past in Monument Valley where an actual band of savage Indians (seemingly) pursues him. Marty hides from them in a cave. Then he sees an army troop riding after them. The implication is that the Indians weren't pursuing Marty. They just happened to be fleeing in Marty's direction. I don't quite buy this. The Indians are whooping and waving their weapons as if they're attacking. You don't waste that kind of energy when you're fleeing someone. What impression would most viewers have of this bit? There's no way to know, but I'd guess most would think, "Savage Indians on the attack!" Few would think, "Innocent Indians fleeing from an unjust pursuit." No one would think, "These Indians could put on suits, take a train to Boston, enroll at Harvard, and get an advanced degree." Which was theoretically possible at the time. I think I made these points once before, long ago. But I recently watched the movie and noticed something else. Its problems go beyond the Indian chase scene. Watching Back to the Future III. Plains Indians on the warpath in Monument Valley? That's racist! So the McFly "farm" is a short distance from where Marty emerged in the past? That would put it square in the middle of the Navajo reservation. I don't think much farming takes place in that arid region. And the McFlys wouldn't have had title to the land. Awkward! Don't you hate it when your great-grandfather pees on you? Yep. So Hill Valley is supposed to be in Northern California? But Marty walked to it from the McFly farm in what seems to be a few hours. Either Hill Valley is in northern Arizona on the Navajo rez, or this is a huge continuity error. The town should be roughly where Kayenta is, and mostly populated by Navajos. Are there any significant hills or valleys within walking distance of Monument Valley? I don't think so. The whole concept of this town is flawed. 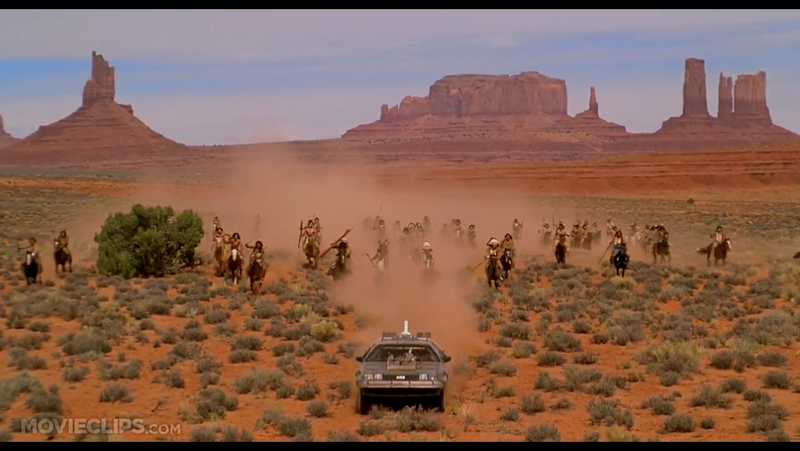 Marty and Doc retrieve the DeLorean, which confirms that they're still near Monument Valley...on the Navajo rez. Still haven't seen a single Navajo. Odd considering the town is in the heart of Navajo country. What this movie does is whitewash US history. White folks have "settled" the land and treat it as if it's theirs. There are no conflicts over land rights or other treaty rights in this phony version of the West. Indeed, white persons, places, and things are the only ones that exist. Not only are the Indians vanishing, they've vanished (except for a few stragglers on horseback). In short, the white filmmakers assure the white viewers that America belongs to them. Whoever owned it before, they're gone.